On Saturday's "Good Morning America," Kate Snow chatted with a woman who once wished death on Clarence Thomas and highlighted her as an expert on racial politics in America. The weekend GMA co-host interviewed Julianne Malveaux on the subject of racial overtones in the conflict between Senators Barack Obama and Hillary Clinton. On November 4, 1994, Malveaux famously stated of Supreme Court Justice Thomas: "I hope his wife feeds him lots of eggs and butter and he dies early like many black men do, of heart disease....He is an absolutely reprehensible person." (Video in the MRC's 20th anniversary Notable Quotables, scroll down to "Damn Those Conservatives Award.") Of course, Snow made no mention of this. She simply introduced the well known liberal as "a noted commentator on American politics." Snow also skipped over the fact that Malveaux is a former talk show host for the leftist Pacifica Radio network. Snow began the segment by offering a look into the politically correct world of a network newsroom. The ABC host and her guest were discussing former President Clinton's use of the word "fairy tale" in relation to Senator Barack Obama and also Hillary Clinton's assertion that it took President Lyndon Johnson to fulfill Martin Luther King's goals in relation to civil rights. Snow confessed, "I have to tell you, we had raging debates yesterday in our newsrooms where people were talking, myself included, very carefully, about this issue. Race and politics, we all get a little nervous talking about all this." And although the ABC journalist never described Malveaux, who is now the president of Bennett College, as a leftist, that didn't stop her guest from gushing over the greatness of the Democratic Party. She enthused, "We have an embarrassment of riches in Hillary, in Barack and in John Edwards. I wouldn't be unhappy if any of them were in the White House." It should also be noted that in 2001, Malveaux defended the inclusion of Syria into the UN Security Council, despite the fact that it harbored Hezbollah. 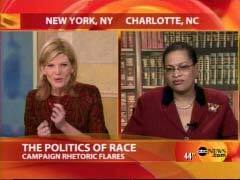 KATE SNOW: And joining us now from Charlotte, North Carolina is Julianne Malveaux. She is president of the Bennett College for Women. She's also a noted commentator on American politics. Good morning, Julianne. JULIANNE MALVEAUX (President, Bennett College for Women): Hi, Kate, how are you? SNOW: I'm well, thank you. I have to tell you, we had raging debates yesterday in our newsrooms where people were talking, myself included, very carefully, about this issue. Race and politics, we all get a little nervous talking about all this. What does it say, do you think, about our country and where we're at that we're so cautious and that we're even talking about all this? MALVEAUX: Well, race is still a lightning rod for us in America despite the enormous hope that is represented by the Obama campaign. The fact is that race still matters. But, you know what, Kate? Gender matters too. I've, as a president of a woman's college, what I have to say is that gender is the only acceptable form of discrimination that we really have in America. And I think some of the scrutiny that Hillary Rodham Clinton has faced speaks to our gender biases as well as our racial biases. SNOW: We spoke with a lot of members of the Clinton campaign yesterday, long-time African American supporters included, who say that they did not intend to insult. They did not intend to make racial comments in any way. Does it matter what they intended or does it matter what was perceived? MALVEAUX: Well, both matter. Certainly they have impeccable civil rights credentials. It does matter that they didn't intend it. But to talk about a fairy tale or to attempt to minimize the legacy of Dr. King, it resonates at a time when the dream has not been realized. So I would say that, you know, the Democratic Party is so blessed. We have an embarrassment of riches in Hillary, in Barack and in John Edwards. I wouldn't be unhappy if any of them were in the White House. But this could be a squabble or a family feud depending on how we play it. SNOW: Bill Clinton says that that fairy tale comment was referring very specifically to the media's coverage of Obama. He says he was talking about Obama's record on Iraq, not about Obama personally. Did you think that - that explanation will resonate? MALVEAUX: You know, he went on talk radio yesterday. I have a couple of the transcripts. He's explained it, and he explains it well. At the same time, it was a very poor choice of words. I think he wouldn't be explaining it if he thought it was the appropriate thing to say. SNOW: Julianne Malveaux, I wish we had more time to get into this. Thank you so much for being with us.